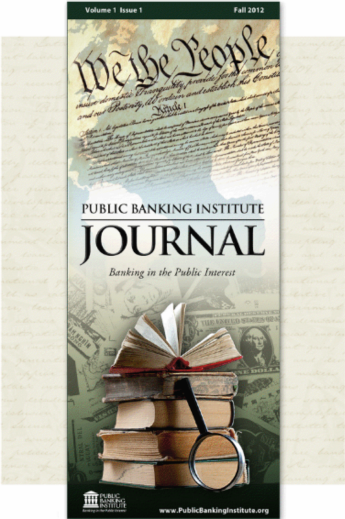 Welcome to the first issue of the Public Banking Institute Journal. We have searched to find the most well-researched and well-written articles in the field. The United States has few publicly-owned banks and little technical literature on the subject; but there is quite a bit to be found by economists in Chile, Brazil, Germany, Spain, and other countries with strong public banking sectors. This literature is little known to mainstream America, and there is much to be learned and shared. We are committed to publishing high quality papers on public banking. Any additional research that can be shared with the growing public banking community is welcome. Join the Conversation -- Join the PBI Journal Blog. If this download link does not work, please send an email request to info@publicbankinginstitute.org and we will email you the PBI Journal. Thank you.